Welcome to Waialua Hawaii (population 3,761). 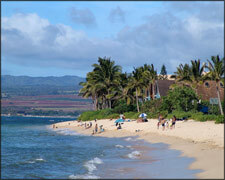 Waialua is one of the communities that make up the north shore of Oahu. Recreational activities include snorkling, fishing, sailing, scuba diving, swimming, surfing and more. Turtle Bay Resort, located in Kahuku, with 36 holes of some of America's best golf, is one of Oahu's most beautiful resorts. Kaiaka Bay Beach Park and Haleiwa Aii Beach Park are both located in the Waialua area, and each is a great spot for parties, swimming, and just hanging out on the beach. Sightseers can visit rainforests, waterfalls, beaches, art galleries, or take an amazing helicopter tour around the island. Waialua is situated just 30 miles away from the Downtown Honolulu, with it's international airport, where residents and visitors find transportation for on and off island.